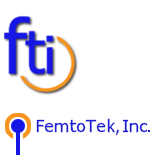 FemtoTek, Inc. is dedicated to the business of getting you the best and most useful measurement data in research, production, and engineering. We provide software products, tools and services that enhance your instrumentation and measurement capabilities. Our customers include both suppliers and users of measurement and instrumentation systems. We support all the widely used software and design platforms including LabVIEW, LabWindows/CVI, C, C++, C#, Python, Perl, Java, SQL Linux, Windows, .NET, Real-time, DSP, VHDL. Contact us for project and architecture advice, an estimate or quotation.